What’s easier: 1) Blowing up a balloon or 2) making it into an octopus? I’ll give you a hint… one is impossible and one is pictured. I am sure you’ve all seen a clown or street performer in your life whip out one of those balloon-animal-balloons, give it a little tug, and then inflate it in mere seconds using only the mouth as a tool. Easy, right? No. No it’s not. I just handed him the balloon. The next day I was back at the store to buy the hand pump which I kinda feel should have a sign or something on it letting rookies like me know it’s not optional. I even asked the girl at the party store if she’s ever tried to blow one of these things up. She just laughed. Ok, moving on. 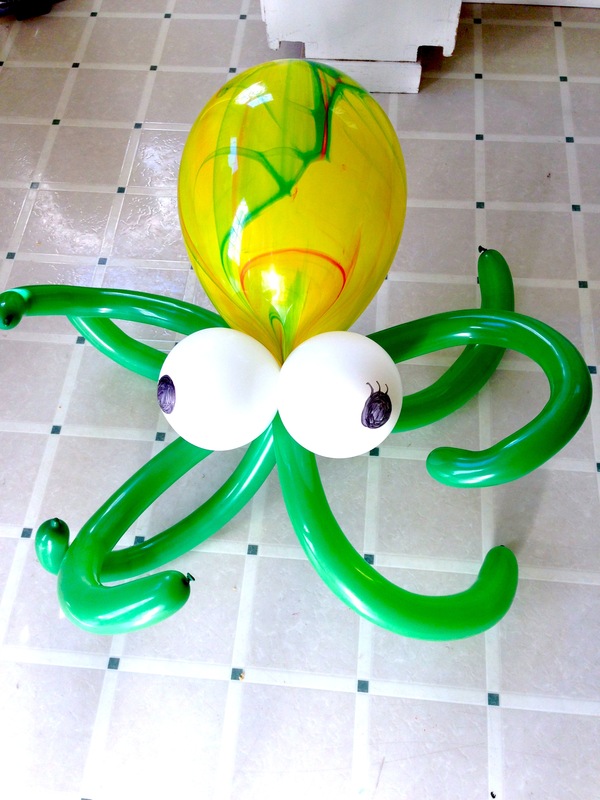 Once you have the pump and some balloons, it literally takes less than 2 mins to make a really cool looking octopus. Even less to make a sword. And I am sure that’s only the beginning. Google “easy balloon animals” and take your pick. Now that I have the pump, it’s a fun thing to have on hand when kids are around. I took the leftover balloons and the pump to the family Christmas… instant party. Even gramps was making creations. Birthday Mermaid and her Octopus sidekick. Oh right, so I didn’t just start down this balloon making path randomly. My daughter’s birthday party was a mermaid party. We rented a park rec center and the entire thing was such an overload of crafty DIY projects that I just can’t write about it all at once. 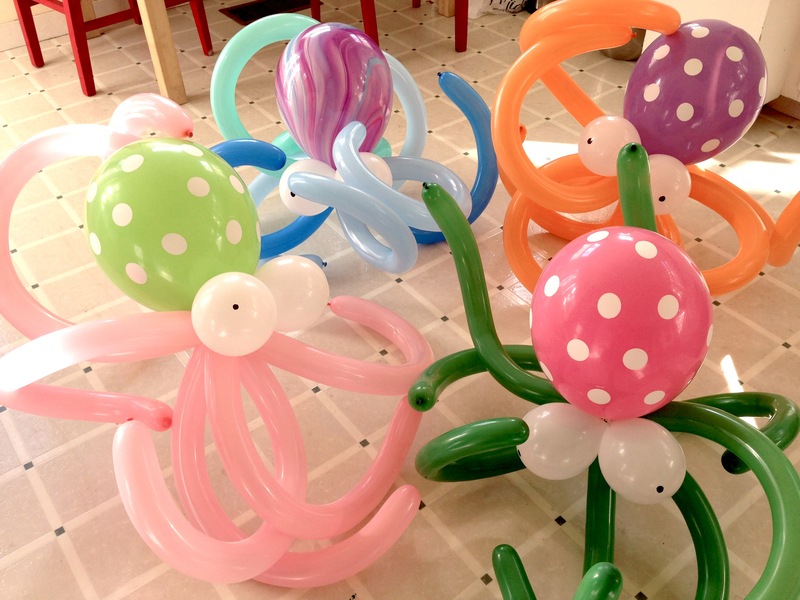 But one of the cheapest, easiest and biggest hits of the party was the Octopus Balloon Dance Party. We blew up (with our actual mouths) a bunch of standard round balloons in shades of blues like the ocean and spread them about the floor. 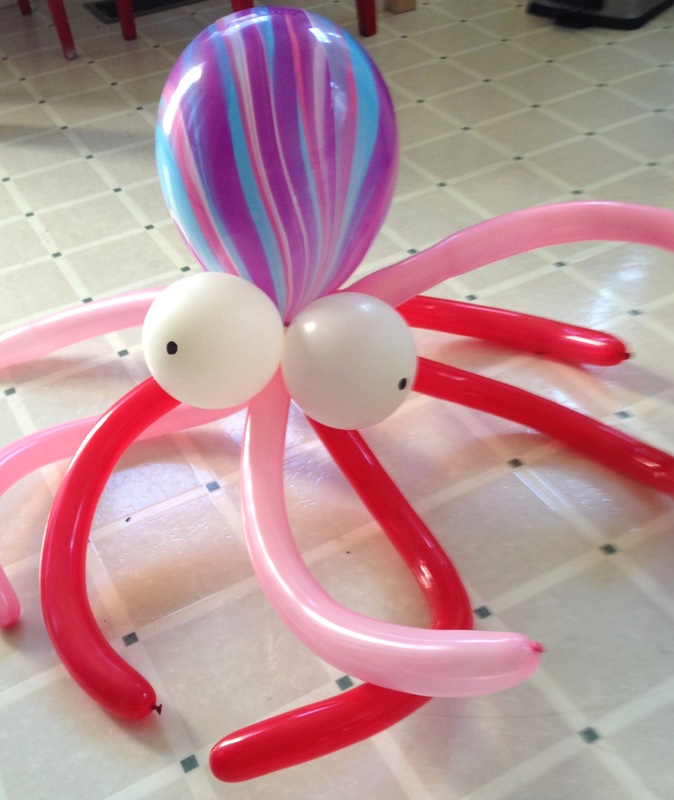 Then I made about eight of these large octopus balloon animals. 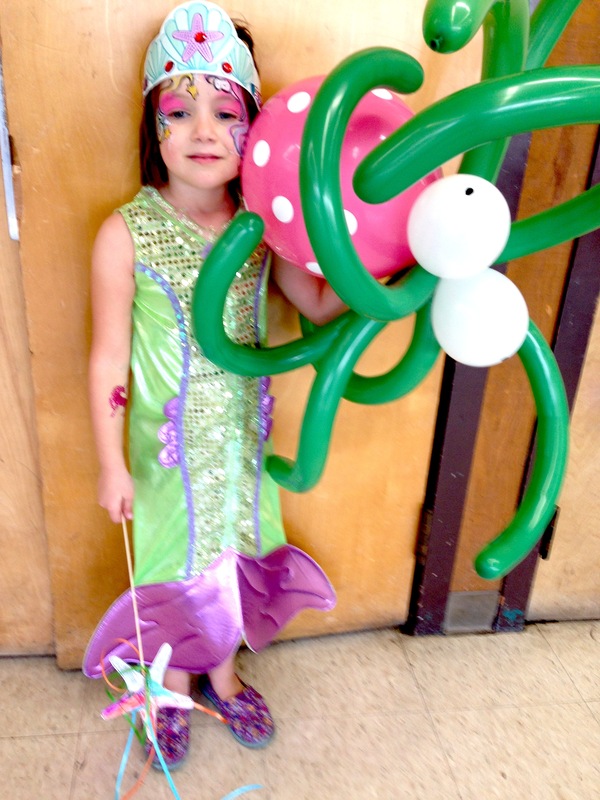 We played the soundtrack from The Little Mermaid and the kids danced and pummeled each other with the octopus balloons. The balloons stood up remarkably well and the kids had a blast. – 1 12″ balloon for the body. I chose polka dots and tie dye. Trust me, don’t let this guys expert inflation skills fool you. Spend the 5 bucks for the frickin’ pump. Eyelashes courtesy of my daughter.